Ivie Sherman loves education movies. As a teacher at Redondo Union High School as well as a private tutor, she often seeks out films that throw public education into the public eye. When Sherman saw an ad for “GO PUBLIC,” a 90-minute documentary portraying a day in the life of public schools in Pasadena, California, she was instantly struck. Sherman immediately submitted a proposal to host a screening in Redondo Beach and was approved in early January. Her screening is scheduled for Tuesday, March 4 at 7:30 p.m. at the AMC South Bay Galleria theater. “GO PUBLIC” was made by Dawn and Jim O’Keefe, a couple who has been married 28 years and have four children who attended public school in Pasadena. The O’Keefes, both film and television veterans, sought to portray the successes and failures facing California publics schools. On May 8, 2012, 50 directors and their small camera crews followed 50 individuals who attend, support and work in the Pasadena Unified School District, a racially and economically diverse district with 28 public school campuses. Administrators, teachers, students, support staff and volunteers reveal their unique contributions in making a public school district function. The film contains no voice-over narratives or expert commentaries. It allows the subjects to speak for themselves. The Pasadena school district was fully supportive of the project. In order to go all the way, “GO PUBLIC” needs an audience. The film has already been screened over 15 times all over the country, from Burbank to Harlem, and has appeared in several film festivals. March 4 is the first time “GO PUBLIC” will be made available to the South Bay. At press time, Sherman had sold only ten of the required 74 tickets for the March 4 screening. 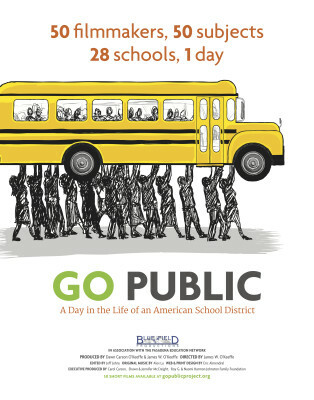 “GO PUBLIC” screens on Tuesday, March 4 at 7:30 p.m. at the AMC South Bay Galleria Theater, 1815 Hawthorne Blvd in Redondo Beach. Tickets are $10 and can be reserved at www.tugg.com/events/7483. The ticket price will not be charged if the screening is cancelled.